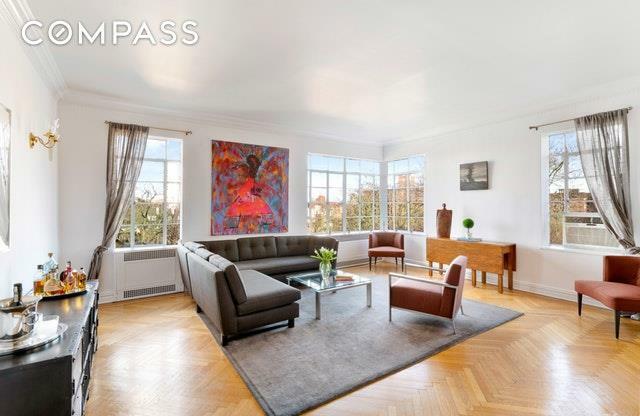 New to the market, apartment 6K is one of the four crowning jewels at the renowned Linden House. 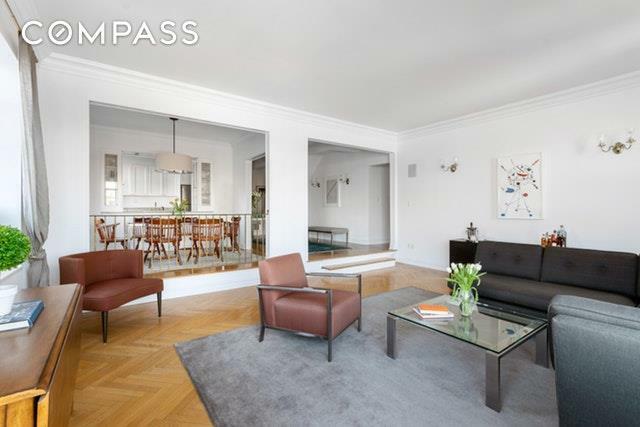 This rarely available 2 bedroom, 2 bath luxury penthouse boasts an expansive, private rooftop terrace with sweeping views of Northern Manhattan, the Hudson River, and the New Jersey Palisades. Spanning close to 2000 square feet, this special outdoor space is perfect for sunset entertaining, alfresco dining, and sublime relaxation.When walking into the apartment, one is greeted by an elegant gallery space, winding staircase, and hints of other rooms to come. 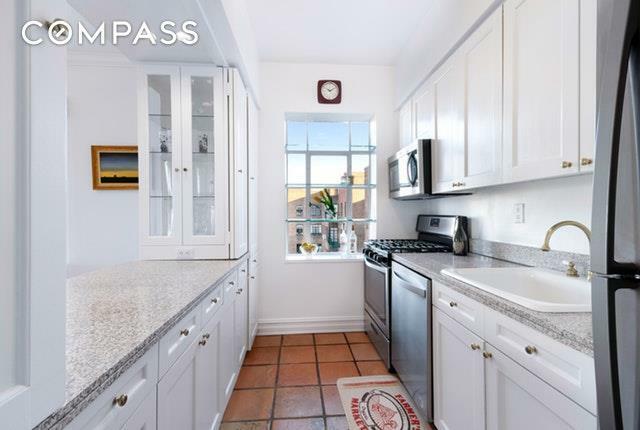 The large galley chefs kitchen with period detail is outfitted in stainless steel appliances, an abundance of cabinets, and granite countertops. The adjacent dining room adds to the overall spaciousness and charm, setting a stage for the large sunken living room with wrought iron handles, oversized casement windows, dual exposures, and high ceilings. This spacious, corner unit is bathed in natural light throughout the day and features gorgeous herringbone wood floors, ample closet space including a large walk-in closet, and a spa like master bath with a deep soaking tub.Set in one of Riverdales premiere, pre-war cooperatives, The Linden House is an iconic example of the architectural grandeur of the 1930s. Building amenities include part time doorman, recently renovated elevators, an outdoor tennis court, sun deck, gym, additional storage, indoor parking, bike storage, and laundry. 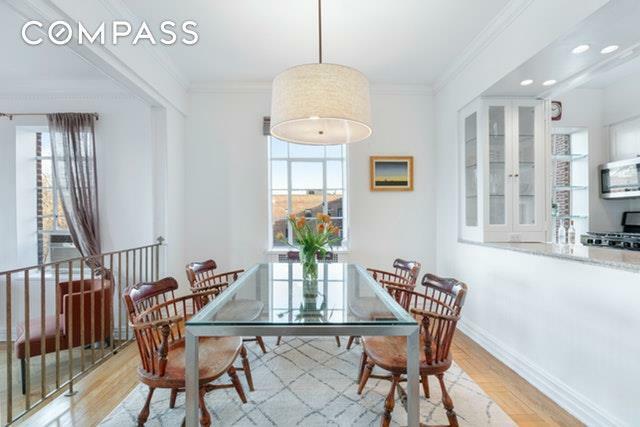 There is a full time super for the building and pets are welcome.This majestic oasis is only a few blocks to the Spuyten Duyvil Metro North train station where one can be whisked to Grand Central in 25 minutes. In addition, local and Manhattan express buses (the BxM1, BxM2, and BxM18) stop right outside the building. Here in Riverdale, one can enjoy the best of two worlds; easy access to Manhattan and the charm of a smaller village. It also serves as a wonderful gateway to upstate New York. There are three great parks in the immediate vicinity, including the 28 acre, garden filled Wave Hill, fabulous restaurants, plenty of shopping and excellent schools. This is a unique opportunity not to be missed! Listing courtesy of Keith Jacoby of Compass.